Indonesia was among the first Asian countries that recognized the Independence of Bangladesh as a sovereign State on 25 February 1972 and among the first countries that established diplomatic relations, marked by official opening of the Embassy of the Republic of Indonesia in Dhaka on 1 May 1972. From then on, the bilateral relations between Bangladesh and Indonesia continue to grow. Late President of Bangladesh Ziaur Rahman visited Indonesia in 1978, and late President Soeharto of Indonesia visited Bangladesh in return in 1979. The then President Ershad of Bangladesh also visited Indonesia in 1987. Visit by the then PM of Bangladesh Sheikh Hasina in 1997 was followed by visit of the then Vice President of Indonesia Megawati Soekarnoputri in 2001. The latter in 2003 returned to Bangladesh in a state visit as the President, and in 2004 the then PM of Bangladesh Khaleda Zia made a return visit. PM Sheikh Hasina went to Indonesia for the second time in 2011 to co-chair the 4th Bali Democracy Forum (BDF), with President Yudhoyono of Indonesia. Bangladesh and Indonesia are active in the Non Aligned Movement (NAM), Organization of Islamic Countries (OIC), D-8, ASEAN Regional Forum (ARF), Centre on Integrated Rural Development for Asia and the Pacific (CIRDAP), Partnership in Population and Development (PPD), Indian Ocean Rim Association (IORA) and other international organizations inside or outside the United Nations. Reflecting the close relations between the two countries Minister of Foreign Affairs of the Republic of Indonesia made a working visit to Dhaka on 14 – 15 March 2013 to meet the Minister of Foreign Affairs of the People’s Republic of Bangladesh, and in less than three weeks later the two Ministers met again in Jakarta on the sideline of the Bali Process meeting. In their meeting in Dhaka, the two Foreign Ministers welcomed many initiatives in furthering the bilateral cooperation in various areas, including trade and investment, agriculture, defence, education, food security, good governance, counter-terrorism, research and technology as well as disaster mitigation and management. The meeting was among others concluded with an exchange of notes for the ratification of the Agreement on Visa Exemption for Holders of Diplomatic/Services Passports signed by the two countries in August 2010, which will surely ease and increase the exchange of visits at diplomatic and official levels between the two countries. The two Ministers also agreed to explore ways and means to establish direct air connectivity between the two countries, which can play a significant role in order to maximize potential economic market. With direct flight route between the two countries, not only the trade and tourism sector volume can increase but people’s leisure and cultural experience will also expand. Commercial relations are developing at a rapid pace and further strengthening ties between the two countries. The bilateral trade between Bangladesh and Indonesia has grown steadily. In 2011 the total trade value between Bangladesh and Indonesia has reached more than US$ 1.4 billion; an increase of 32.35% compared to 2010. In 2012 the trend of increasing total trade value still continues, with total trade value in first quarter of 2012 reached US$ 290.5 million; an increase of 17.36% from US$ 247.55 million in the same period in 2011. With the total trade increase averaging in 19% for 2007-2011 and the stable economic growth in Bangladesh and Indonesia, in 2017 the total bilateral trade value between the two countries can be expected to reach US$ 2 billion. 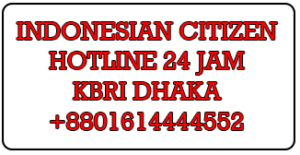 Every year Indonesia offers scholarship programs for Bangladeshi youth, which consist of one-year Non-Degree program of Darmasiswa RI Scholarship and 3-year Master Degree program of Full Scholarship in the framework of Developing Countries Partnership (Kemitraan Negara Berkembang/KNB). Indonesia also offers various training programs in various fields in technical cooperation schemes. Indonesia – Bangladesh, have agreed to strengthen economic and trading cooperation. Both countries notice the need to take further important steps to increase and balance bilateral trading through food production, mining, agriculture, health and small-medium enterprises (SMEs). In this occasion, Indonesia expresses its interest to learn further on the success of Bangladesh in developing micro credit for the poor, while Bangladesh needs coal supply to generate power plant of Bangladesh as well as expects further cooperation to stimulate foreign investment especially from Indonesia’s investors to build infrastructure network. Indonesia and Bangladesh also regard the importance of direct link between two countries to increase the number of tourists and enhance the intensity of people – to – people contact from both countries. Indonesia sees Bangladesh as one of its major trade partners in South Asia because of its unique geographical location, which links the South Asia region with South East Asian nations. The similarities and commonly shared culture, religion, custom and social values, as well as historical background are other related chapter of potentials that lead to the peoples of the two countries to more actively interact , mutually complete and share one to another in the framework of boosting the bilateral relations and cooperation between Indonesia and Bangladesh. Recently, the bilateral trade between Indonesia and Bangladesh reached 1.40 billion US dollars showing an increase of over 32% over the previous year.